The relevant authorities together with residents outside the home. The two-year-old’s mother allegedly often leaves her unattended to go drinking according to the community. Ward 71 councillor and various stakeholders recently came to the rescue of a two-year-old child who was left unattended for more than a day, reports Rising Sun Chatsworth. Since the rescue, the girl has been placed in a safe home while social workers investigate. 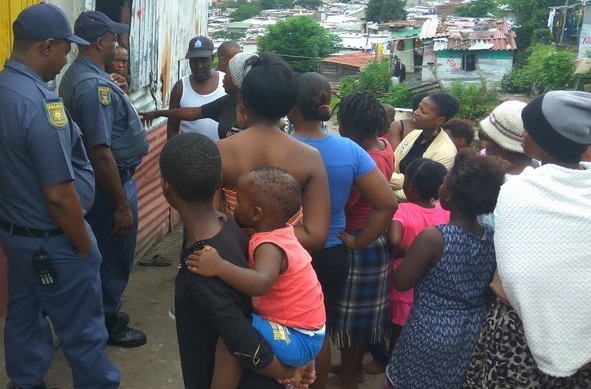 A concerned member of the community, Vikelo Masebenza, had opened the home and removed the child and attended to her. “I was notified of a situation in Road 1104, Crossmoor, where a mother had reportedly left her two-year-old child unattended for over a day and had gone out drinking. According to irate members of the community, it was common for the mother to leave her child locked in her home from Friday and only return to the home on Monday. The child would be locked without any food or attention,” Masebenza claimed. Together with the assistance from Chatsworth SAPS, the Victim Friendly Centre, chairperson of the Chatsworth CPF Jakes Singh, and Clive Pillay from the Nelson Mandela Community Youth Centre, the child was removed from the home and care of her mother and placed in a safe home until social workers were able to conduct a full assessment. Cllr Vedan extended his heartfelt thanks to everyone who assisted and offered support.